Independent reviewer looks at the best options to detect and repair problems, and keep networks humming. 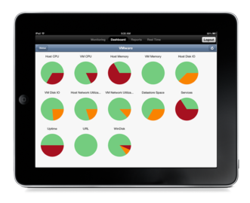 iPad support provides Longitude users with instant access to critical IT information. Heroix offers high-value VMware monitoring, capacity planning and What-if analysis that looks at resource utilization in order to gauge true application performance. Heroix, developer of application performance and network monitoring software, today said that its Longitude management suite was cited as a leader in the recent Network World Clear Choice Product Test. are highly scalable, reliable and easy to use. “In other words, it has to be able to do it all,” he summarized. Heroix software is currently in use on thousands of systems around the world, in enterprises large and small. The efficiency and intelligence built into the software enable better results with less effort, and provide exceptional versatility to address routine and unique management challenges, helping companies save time and money. delivers What-if analysis to determine where and how potential changes will affect capacity and performance. The review also noted that Longitude automatically updates itself and performs maintenance functions on its own database if desired. Reviewer Nance runs Network Testing Labs, which conducts independent technology research and product evaluations. He is the author of Introduction to Networking, 4th Edition and Client/Server LAN Programming. For more information and resources on application and network monitoring, visit Heroix's online resource library. Longitude 8.1 is available now. Please visit Heroix or call 800-229-6500 or 781-848-1701. Heroix also offers a 14 day free trial of all Longitude Editions. Pricing begins at $399. Heroix provides best-of-breed application performance monitoring solutions and delivers the fastest, easiest-to-use, and most affordable application, network, system, and VMware monitoring software available today. Heroix network management products are highly acclaimed and in use on thousands of systems around the world, in enterprises large and small. Heroix, Heroix Longitude, RoboMon, Heroix eQ, and their corresponding logos are registered trademarks of Heroix. All other company and product names mentioned are used only for identification purposes and may be trademarks or registered trademarks of their respective companies.